The Hook2 5x Fishfinder with SplitShot technology features wide-angle 200 kHz sonar coverage and DownScan Imaging for the clearest underwater images. GPS Plotter for basic waypoint marking and navigation to a saved point. Cover more area in less time when out on the open water with the Lowrance Hook2 5x Fish finder, with the split shot 2 in 1 built in sonar that provides a wide angle 200kHz as well as DownScan imaging giving you double the advantage to finding where those fish are hiding. With a bright and crisp color 5” Solarmax display and built in GPS Plotter you can save waypoints and navigate accurately to all of your favorite fishing spots or just get back to the dock safely after a day of fishing. The Hook2-5x Splitshot has a simple menu layout along with a user friendly dedicated keypad providing easy operation, eliminating multiple key presses to perform a task. You will be amazed at how the feature Autotuning sonar adjusts automatically as water conditions change, keeping you focused on fish instead of fine tuning. The included transducer provides the user traditional sonar capability with downscan imaging showing you what’s beneath your boat! The Hook2-5x will come to be known as the easiest to use Fishfinder on the market. If you’ve been looking for an affordable solution for fishing your search is over. *Please note that HOOK2 x-Series fishfinders do not have mapping capabilities. The built-in GPS provides waypoints and tracks only. Split screen views not available on this model. View one sonar technology at a time. 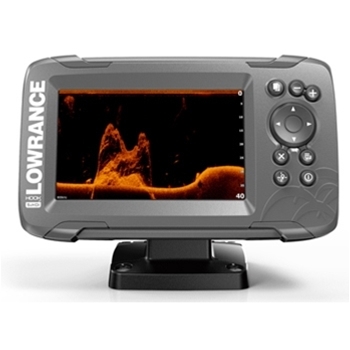 Lowrance’s HOOK2 4x with GPS has a bright, 4” color display and exceptionally detailed, wide-angled broadband sonar making this is a top-choice option for your fish finding needs! Built-in GPS sensor provides the ability to save waypoints and tracks. Lowrance’s Hook2-7x SplitShot with DownScan provides a 7” SolarMax color display, automated sonar settings, an easy to use menu operation, and a quick and easy installation format, perfect for all of your fishfinding needs! 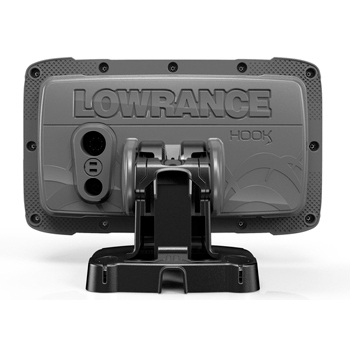 The HOOK2 7x from Lowrance is a top contender in stand-alone fishfinders. 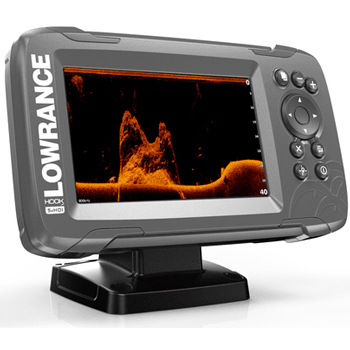 With built in 3-1 TripleShot Sonar – High CHIRP, DownScan and SideScan this Fishfinder is sure to impress. A built in GPS enables waypoint marking and trackback.